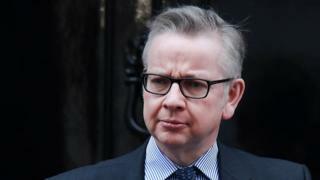 Image caption Michael Gove says: "Nothing is agreed until everything is agreed"
Voters can use the next general election to have their say on a final Brexit deal, Michael Gove has said. The environment secretary praised Theresa May's "tenacity and skill" in securing a last-minute deal to end phase one negotiations on Friday. But, writing in the Daily Telegraph, he said if British people "dislike the arrangement", they can change it. 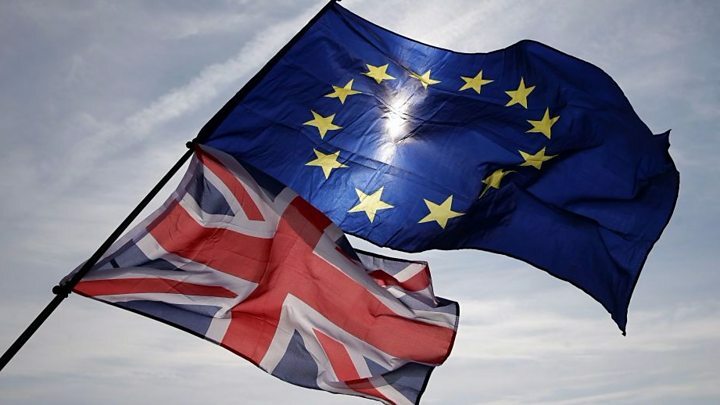 Reports suggest the cabinet will meet on 19 December to discuss its "end state" plans for Brexit. This is just two days before Parliament's two-week Christmas recess. Mr Gove, one of the cabinet's leading Brexiteers, said the primary agreement between the two sides had "set the scene for phase two" negotiations - where issues such as trade will be discussed. But he said that "nothing is agreed until everything is agreed" at the end of the process. After a two-year transition period, the UK would be able to pass laws with "full freedom to diverge from EU law on the single market and customs union," he added. And the British people would "be in control" to make the government change direction if they were unhappy, he said. "By the time of the next election, EU law and any new treaty with the EU will cease to have primacy or direct effect in UK law," said Mr Gove. "If the British people dislike the arrangement that we have negotiated with the EU, the agreement will allow a future government to diverge." The next general election is currently due to be held in 2022, three years after the UK leaves the EU. However, it could be sooner if the prime minister calls one, and MPs agree to it, or if the government collapses. The former Conservative leader, Iain Duncan Smith, said the next phase - the trade discussions - would be the "bruising but vital bit". European Commission President Jean-Claude Juncker said Friday's deal was a "breakthrough" and he was confident EU leaders would approve it at a European Council summit next week. Citizens' rights: Three million EU citizens currently in the UK would be allowed to continue living and working there. Those already in the country, without permanent residency, would be able to acquire it after Brexit. The one million or so UK citizens living in an EU country after Brexit would get the same rights, under the agreement. Money: The so-called "divorce bill" will amount to between £35bn and £39bn, Downing Street sources say. This includes budget contributions during a two-year "transition" period after the UK leaves the EU in March 2019. The precise figure is unlikely to be known for some time. Irish border: There will be no "hard border" between Northern Ireland and the Irish Republic. But it also sets out a fallback position if the UK fails to agree a trade deal. This could prove controversial because it says there will continue to be "full alignment" between the EU and Northern Ireland on some elements of cross-border trade, as set out in the Good Friday Agreement. What's been the reaction from politicians? Northern Ireland's Democratic Unionist Party, whose opposition on Monday led to talks with the EU breaking down, said there was still "more work to be done" on the border issue and how it voted on the final deal would "depend on its contents". Barry Gardiner, Labour's international trade secretary, called the agreement on the Irish border issue a "fudge", saying Mrs May appeared to have contradictory red lines. His party wanted to see an agreement which harmed neither the settlement, nor the economic situation, he said. Justice minister Dominic Raab said the details of how to deal with the issue of the Irish border had still to be worked out in full. "You can call it strategic ambiguity, you can call it constructive ambiguity... what I am admitting to you, very openly, and honestly, is that we have agreed principles, but that the details still need to be ironed out on this very bespoke set of issues around Northern Ireland which can't be dealt with properly and responsibly outside of the context of the broader negotiation on customs and trade and all of those other things we have said all along," he told BBC 2's Newsnight. Leave campaigner Andrea Leadsom, leader of the Commons, said the overall deal was a "significant achievement" for the prime minister. "People on all sides of the argument are now seeing that she is determined and is succeeding in making a success of leaving the EU," she said. Fellow Leave campaigner Iain Duncan Smith said it had been fascinating to see the EU's reaction after failing to secure a deal in Brussels on Monday. "They realised they were staring down the eyes of a no-deal, and so they got into action for the first time for many months, and literally drove with the UK government the changes that were necessary to get this thing on track. "Why? The EU recognises that they really do need and want a free trade arrangement with the UK," he told BBC Radio 4's Today programme. Liberal Democrat leader Vince Cable said Mr Gove wanted to deny the public the right to block a poor deal and the only way to give people control was for a vote on the terms of the deal, with the option to exit from Brexit. Sir Andrew Cahn, a former head of UK trade and investment, said it was "simply not true" that the EU had blinked first. It was, he said, the UK which had done so by agreeing to pay more money and by fudging the Northern Ireland issue. He said the UK had done the "easy bit" and now it had to decide what sort of arrangement it wanted with the EU, which has not been done yet. On Friday, the EU's chief Brexit negotiator, Michel Barnier, said the UK was "closing doors" on its future relationship with the EU by laying down "red lines" in the negotiation, including leaving the customs unions and the single market. They leave the UK with only one way forward, he suggested - a free trade agreement on the Canadian model. "It is not us, it is the British government, which is indicating these red lines that is closing certain doors. That is the model we are going to have to work on," he said. Would Canada's deal with the EU be a good model for the UK? What other models could the UK follow? There are plenty of technical details in Friday's agreement that still need to be clarified, which will have to happen in parallel with any discussions about the future. If EU leaders approve the agreement at an EU Council summit next week, talks can then move on to a transition deal to cover a period of up to two years after Brexit and the "framework for the future relationship" - preliminary discussions about a future trade deal. However, the EU says a deal can only be finalised once the UK has left the EU in March 2019. Before that, the UK government has to decide what kind of Brexit, and what kind of future relationship with the EU, it really wants. A final withdrawal treaty and transition deal will have to be ratified by the EU nations and the UK Parliament, before the UK leaves.